FALL RIVER, Mass. (AP) — A woman who crashed her car into a Fall River apartment building, setting off a massive fire, died Tuesday, authorities said. Hours after officials said the fire had been put out, the blaze flared again. 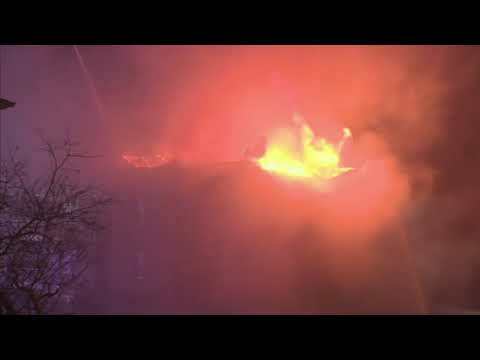 WHDH-TV aired footage of flames coming from the roof of the Four Winds Apartments on North Main Street. Firefighters were dousing them with water from a cherry picker attached to their truck. The fire began Tuesday morning after 72-year-old Judith Mauretti, of Fall River, crashed her car into the building. Emergency crews arrived to find Mauretti dead in her vehicle, the Bristol District Attorney’s Office said. A 75-year-old Fall River woman who was a passenger was taken to Rhode Island Hospital in critical condition. The building was evacuated after the crash, which ruptured a gas line, WHDH reported. The district attorney’s office earlier said all of the occupants were accounted for and there were no reports of injuries among them. Four firefighters were hospitalized for exhaustion. Fall River Fire Chief John Lynch told the Herald News none was seriously injured. Witnesses said the car was moving fast Tuesday morning when it jumped the curb and crashed into the building, according to Lynch. He told the Boston Globe that the car drove 15 feet (5 meters) into the first floor of the building. More than 100 firefighters responded to the initial blaze and, at one point, crews were forced to retreat as flames pushed out from the building’s windows. Several apartments in the 36-unit building were damaged.